Twitter’s Adding Paid “Fake Trends” Advertising, But Will Users Object? Twitter‘s march to earn a dime or two from its millions of users and billions of tweets per month is picking up speed. Twitter‘s march to earn a dime or two from its millions of users and billions of tweets per month is picking up speed. Now we’ve learned that the plans for advertising include paid “promoted trends” among the more usual trending topics. We know Twitter’s in the process of maneuvering its advertising systems into position, but the discussion over at AllThingsD is the first we’ve heard of “promoted trends.” It’s an extension of Twitter’s “promoted tweets” system whereby advertisers can pay to get a little more limelight thrown on their particular promotional status updates. 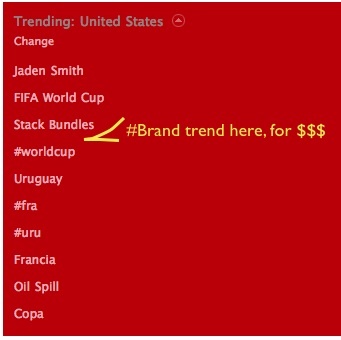 It works pretty much how you’d expect: Advertising partners can hand over cash to “buy” placement of a trending topic phrase in Twitter’s list of hot topics that appears on its home page. The fee for doing so may equal “tens of thousands” of dollars a day, it seems, but for that the ad partner will get its chosen phrase in front of literally millions upon millions of eager eyeballs. When users click on the promotional trend phrase, they’ll get taken (as usual) to a page containing the tweets that mention the trend words, with the company’s promotional tweets prominently at the top. Many things remain unclear, though: Will everyone on Twitter see the “artificial” trends, or will they be localized or targeted at particular users? Will the trend page be unfiltered, comingling disparaging and negative tweets with the paid trend phrase? Will the trend phrases be entirely at the ad partner’s whim, or will they have to be connected to a “real” trend, something like “Coca-Cola World Cup”? Will the trend list stop being relevant to the users and get filled with too much distracting spam (ironically the very opposite end-result that services like Tweetbeat are trying to defeat?). Perhaps the biggest question rests on how exactly Twitter’s userbase will react to having “artificial” trends foisted upon them. Trending topics are a hot subject for some users. When Twitter tweaked its trend algorithm recently to be more representative, shifting the trend “Justin Bieber” out of the list, his outraged fans worked out how to game the new trend system. Given Twitter’s free and open architecture, it’s easy to imagine some promoted trends going very wrong and spurring backlash.